These days, paper maps, atlases, and compasses are perhaps more likely to be found in museums – or at least stored away – than spread out on the modern kitchen table when planning a trip or trying to locate somewhere. In modern times, we’re much more likely to use our GPS, plot our course through MapQuest, or use some newfangled gadget I’ve never heard of :). But, of course, it wasn’t always that way. For hundreds of years, paper maps were our only real way of figuring out how to get somewhere. And even THEY had to start somewhere. Maps have been around for a VERY long time but atlases – a collection of bound maps – not as long. 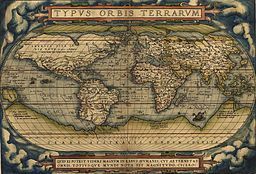 In fact the first modern atlas was published on this day in 1570, by Abraham Ortelius in Antwerp, Belgium. Called Theatrum Orbis Terrarum (Theatre of the World), it included seventy different maps in its first edition. By its thirty-first in 1612, 167 maps were included. Maps have come a long way from cave drawings. Sometimes we forget that. Appreciate how easy it is to figure out where you’re going these days – but don’t forget to use the APPROPRIATE navigation tools in your stories – especially if they aren’t set in modern times! How do you navigate these days? How about ten years ago? Twenty?